This glossy magazine about Saudi Arabia was photographed in 2018. 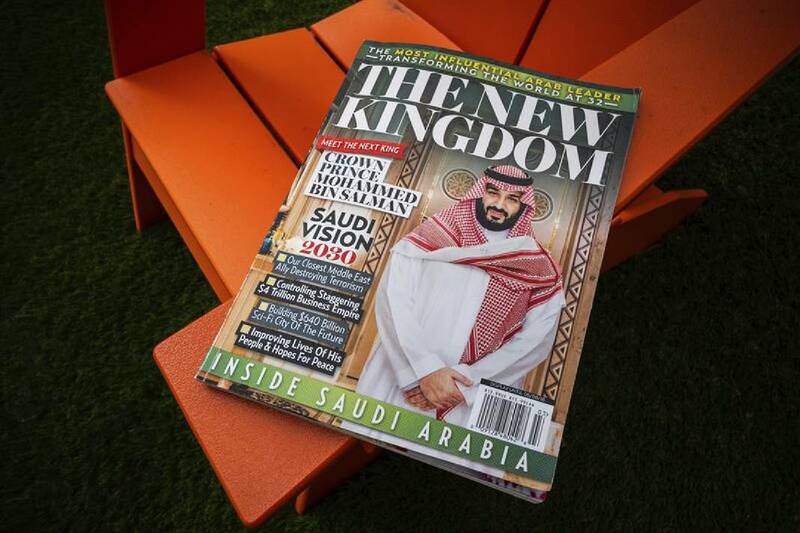 The mystery behind the origins of the pro-Saudi magazine that showed up on U.S. newsstands grew amid revelations that the Saudi Embassy in Washington got a sneak peek. Another puzzling piece of fallout from the Jeff Bezos/National Enquirer soap opera is a glittering Saudi connection. Bezos, founder of Amazon, published emails from the National Enquirer last week that he says amount to blackmail, demanding not money, but a public statement from him saying he sees no political motive in the Enquirer's expose of his affair with a former TV anchor. If he didn't comply by making that statement, which he claims would be a false statement, the Enquirer would publish salacious pictures from his texts. Instead, he put the whole story and the sleazy magazine's letters in an online blog at Medium.com. But in his story is a less-explored thread about the Washington Post's coverage of the Saudi killing of Post columnist Jamal Khashoggi last year and an Enquirer/Saudi connection. While much of the media, this page included, focused mainly on Bezos' writings suggesting a Trump political motive, Bezos also noted the Khashoggi/Saudi coverage and pointed to a story by The Associated Press last April about the "mystery" of a pro-Saudi tabloid landing in supermarkets across America the month before. It was 97 glossy pages, fawning over Saudi Arabia and its ambitious crown prince, Mohammed bin Salman. The magazine, titled "The New Kingdom," was produced by American Media Inc., AMI for short, the parent company of the National Enquirer. As AP noted, the crown prince was not a household name in the U.S., and "at $13.99 a copy with no advertisements, the publication seems unlikely to be a money-maker." Further, AMI spokesman Jon Hammond told AP, "Absolutely not," when asked if AMI had collaborated with the Saudis on the magazine or been paid by them. And Saud Kabli, the Saudi Embassy's communications director, said the embassy had "no role in the production of the magazine." Yet files obtained by AP showed that a digital copy of the magazine was quietly shared with officials at the Saudi Embassy in Washington almost three weeks before its publication. "How the early copy made it to the Saudis is unclear," states the April AP story. "Yet the revelation adds another mysterious twist to a murky tale playing out against the backdrop of bids by both President Donald Trump and David Pecker, the tabloid publisher who supports him, to build goodwill with the Saudi kingdom's leaders." The story says AMI denied it shared an advance copy with the Saudis or consulted with them on the project, "but an individual with knowledge of the situation said AMI indeed reached out to Saudi officials in the U.S. before publication to seek help with the content. The Saudis never responded, said the individual, who wasn't authorized to comment publicly and requested anonymity." Metadata embedded in the PDF file also showed that the next day — Feb. 20 — Saudi officials had started forwarding it to Washington foreign policy contacts, giving them an early look. And a month later, The New York Times published a story claiming Pecker turned to Trump to help cement a relationship with the Saudis to grow his businesses. That was the month AMI published the 97-page magazine. Trump has defended the Saudis and insisted the prince had nothing to do with the brutal murder of the journalist. Just last week, a bipartisan group of lawmakers pushed legislation to impose sanctions on Saudi Arabia to hold them accountable for Khashoggi's death. There is still mystery, but the dots may be starting to connect.